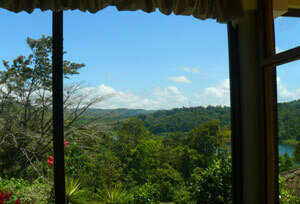 Rainbow Bay, site of Lake Arenal's best-featured planned community. With two swimming pools, indoor tennis courts, clubhouses, a dock, a beautiful setting in a protected cove, the gated community Rainbow Bay provides amenities to delight the sports-minded and beauty and security to make living at Lake Arenal a constant pleasure, especially in a luxury home such as this three-year-old 2-bedroom, 2.5 bath, two-story home on well over an acre. 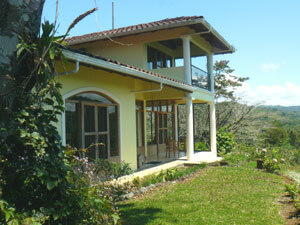 The home has not only lake views but a view of Arenal Volcano (cloud-covered on the day of these photos). Included in the sale of this home are a slip at the community dock and a 20-foot sailboat. Purchase of the furniture is negotiable. 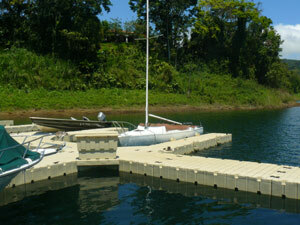 Rainbow Bay, one of the two best planned communities at Lake Arenal, is 2 miles from the town of Nuevo Arenal. Though the community's amenities are just a few minutes' walk away, the home is out of view of other homes. There are two additional volcano-view building sites on the lot. The home has satellite TV, a security alarm system, and upgraded lighting. Privately situated on the community's 40 acres, the 3-year-old house is reach by a long curving driveway. Rainbow Bay, seen here from the living room, is well protected from the weather and has excellent fishing. 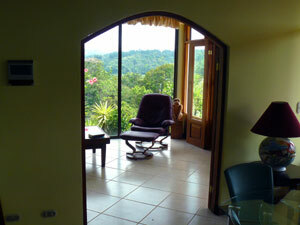 Clouds hid the garden room view of Arenal Volcano on this day. 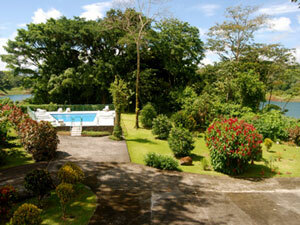 The community's main pool is close to a club house and the tennis courts. 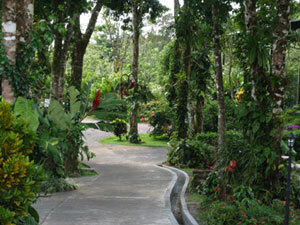 The planned community, established in 2002, has pleasant pathways through the grounds. 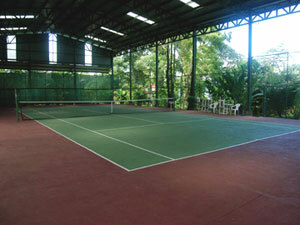 The indoor tennis court is well maintained as is the whole community. 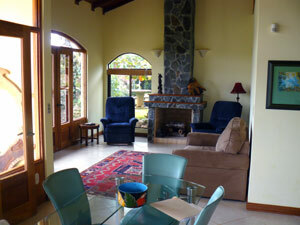 The open plan features includes high ceilings and huge windows to make the most of the tropical location. 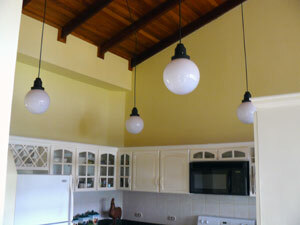 The kitchen lighting and custom-made cabintry indicate the many fine features of this most enjoyable home. 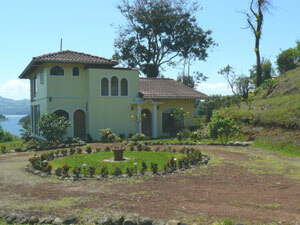 On the acre+ lot, the house sits at the bay end, leaving plenty of space for building. This 20-foot sailboat at the community dock is included in the sale of the property. The garden room has especially good views. 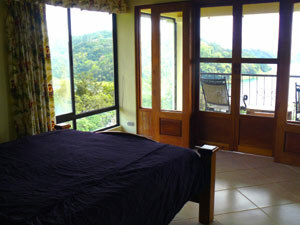 The master suite includes a large balcony. 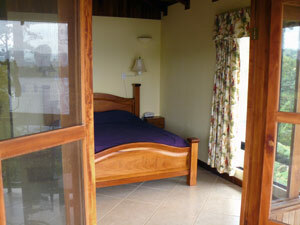 The master bedroom and balcony. 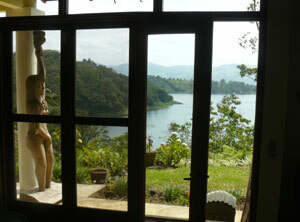 The views of bay, lake and volcano are great from here. 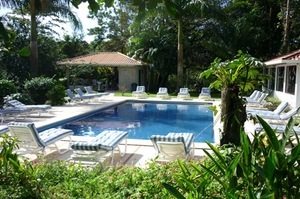 The second community pool is tranquilly located away from the courts and clubhouse. .